Huong Ngo is the healthcare account manager for BowerGroupAsia in Vietnam. She manages government affairs services for clients in the healthcare sector. 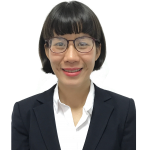 Prior to joining BGA, Huong was regulatory and government affairs manager for the pharmaceutical company Gedeon Richter. In this role, she closely monitored changes to laws, regulations and requirements and analyzed the impact of these changes on health care companies. She also advised the company’s country manager on ways to develop positive relationships with the necessary regulatory authorities to facilitate and positively influence exchanges on regulatory issues. Huong is a pharmacist and has more than a decade of experience working on health regulatory issues in Vietnam. She earlier worked as regulatory affairs manager for a number of leading pharmaceutical companies such as Hyphens Pharma, Pfizer and Gedeon Richter. She has a deep understanding of Vietnam’s regulatory environment and its impact on pharmaceutical companies. Huong holds a bachelor’s degree from Hanoi Pharmacy University.